Meghan Fitzgerald is founder and chief learning officer at Tinkergarten, which began in New York and is now expanding to other communities—including Austin!—to offer outdoor early childhood education classes for children and their parents. We invited Meghan to join us on the blog to share her considerable mud-making expertise. I must admit that, as a former principal and brand-new mom of an eight-month-old, I was a bit uncertain about making mud, and I certainly wasn’t thinking of it as a transformative experience. “Making mud? What’s the point?” I wondered. “Is it worth the mess?” This was before my forest school training and before I started to really spend time with tiny people outdoors. It turns out the simple act of making mud is a universally powerful pastime for young people (and not bad for us big kids, either). Yes, kids get messy. (Fair warning: They may even try to taste the mud.) But with a few exceptions, kids get completely absorbed in this pursuit. The great news for parents is you can do this virtually anywhere—with the most basic of materials (water + dirt!). Armed with a few tips, parents can help unleash the activity’s rich learning potential. Play in the mud along with your kids, and you’ll inspire immediate smiles as well as a lifelong comfort, even pleasure, in mucking around. That kind freedom spawns unbridled creativity and joy that’s just plain good for the soul. So let them go for it—you can make an outdoor cleanup part of the fun too! Pack a few materials: Unless you’re near a water source, you’ll need to bring it with you. 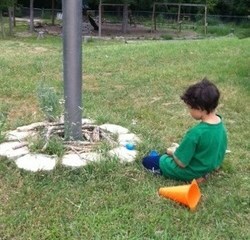 We like to have around half gallon of water per kid so they can play and experiment for a while. Bring a small pail or container for each child so she can pour water as desired without dumping your entire supply. Clear your spot: If you’re in a high-traffic area, check to make sure that there are no obvious hazards (e.g., broken glass, metal, dog doo, trash) where you’ll be making your mud. As you scan the ground, grab some sticks that kids can use for stirring and mushing mud. Pour a little water. Then let them do the pouring: Trickle a small amount of water on the ground, and discover together what happens to the dirt. You can take a stick and even do a little mixing. Then hand a bucket to your kids, inviting them to transport water and see what happens when they add it to dirt. Stand back, and watch them get to work. Dole out the water as you go: Allow (or help) kids to fill up their pails or cups and dump water as often as they like. Playing with water is, in and of itself, a super engaging lesson in cause and effect and physics. We prefer filling a large container (e.g., 5-gallon bucket) and letting kids serve themselves. Play and “ooooooh” alongside them: Let them continue to pour, mix, and make mud on their own, but do the same alongside them. Every now and again, “Ooooh” or “Ahhh” at the mud puddles, rivers, and piles you make. Ask kids if they notice a difference between their mud and yours, giving an opportunity to describe the different muds using words such as soupy, thick, chunky, dry, wet, or sticky. Such a gripping sensory experience is a great opportunity to build language. Make something (optional): If you think they are ready for more, do not interrupt their play. Simply make a mud pie by forming a fistful of mud into a patty and plopping it down somewhere. Gather nature treasures to decorate it (our oldest loves to make pizza mud pies most). Kids will likely get intrigued by what you are doing and want to try it too. If you have older kids (ages 3+), you can make mud faces on the trees! Why is this activity great for kids? Playing and experimenting with ooey, gooey mud helps children to strengthen their sense of touch—and we know that the better kids are able to tune and integrate their senses, the more effectively they can learn. Once kids know how to make and manipulate mud, they have a tool for play and building with virtually unlimited uses. When kids transform the shape, texture, or nature of materials (in this case, turning dirt and water into mud), they also engage in a universal behavior pattern called the transforming schema, which supports brain development. Best of all, when you let kids lose themselves in play and give them room to mess around, you offer them the openness and freedom they’ll need to develop true creativity down the line. If all this isn’t compelling enough, research also indicates that playing in the dirt is just plain good for kids’ health. So go on, get dirty! Johnnie Smith, Conservation Education Manager at the Texas Parks and Wildlife Department, joins us on the blog to let you know about three great programs that help students, educators, and families learn about nature firsthand. 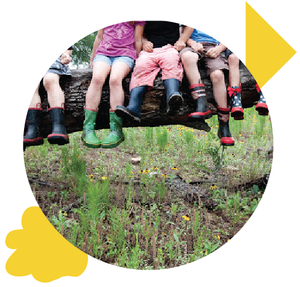 Texas Children in Nature is a network of more than 300 partners from around the state who are dedicated to connecting all Texas children and their families with nature to be healthier, happier, and smarter. TCiN reaches the many diverse Texas communities through regional collaboratives that bring together nonprofits, government agencies, businesses, and individuals to focus on the issues and solutions that are relevant to them. Through our unified messaging, our partners help raise awareness about why kids need nature and how everyone benefits when children and families spend more time outside. No one agency or organization can get every single child outside—but together we can! In 2013 we conducted a survey of our partners; the 28 percent who responded reported serving almost 4 million youth with their outdoor programs and events. According to the American Academy of Pediatrics, children and teens today spend between 7 and 11 waking hours per day indoors, isolated, and with media. You can help stem the tide of nature deficit disorder and create real solutions to get kids plugged into nature. Find your regional leaders at TCiN! The Texas Parks and Wildlife Department sponsors a suite of Project WILD programs, each offering a special iteration of this outstanding, hands-on approach to learning. Project WILD is a kindergarten through 12th grade environmental and conservation education program emphasizing awareness, appreciation, and understanding of wildlife and natural resources. It is interdisciplinary and supplementary and can be used to teach basic skills in science, social studies, language arts, math, art, music, and physical education. Texans know about drought. What they may not know is that, due to global weather patterns, the chances are high for another 10 to 15 years of persistent dry weather. Our water habits must change. 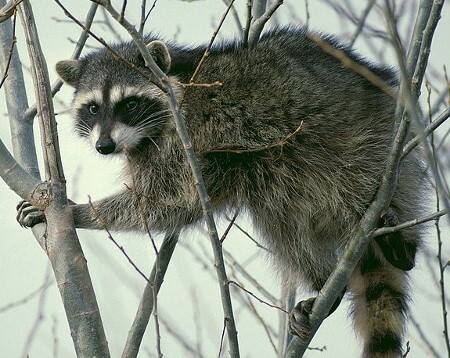 Wildlife needs clean, fresh water in the habitat, in seasonally appropriate amounts. Whether that habitat be upland, forest, riparian, subterranean, wetland, or estuarine, wildlife will not survive without it. While terrestrial species require water for sustenance and for the vegetation that supports the food web, aquatic species rely on water not only for these needs but for completion of their life cycle as well. Everything we do on public and private lands affects our natural environment, directly or indirectly. Unlike plants and animals, however, we can choose a role that determines our impact. Texas Parks and Wildlife has put together a special website with resources to help prepare both children and adults for informed, effective action in saving water for wildlife. Every positive step you take helps us all. 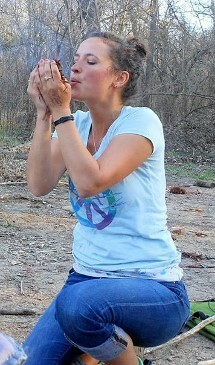 Michelle Carbone is the youth programs coordinator and an instructor at Earth Native Wilderness School. 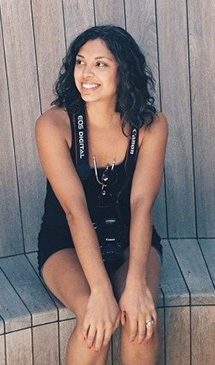 She also contributes to the Kids in Nature Blog, where an earlier version of this post originally appeared. Thanks for sharing your expertise with Alt Ed Austin’s readers, Michelle! It’s taken time for me to get used to some aspects of outdoor education. Teaching children to use knives and make fire, as well as hiking with preschoolers (we really are hiking, not just walking), have been some sources of apprehension. But each day, each moment I’m with these children, I not only realize anew how capable they are but also discover more ways to help ensure their safety. Before the first tools, butter knives, were even handed out in a recent class, we discussed knife safety. We explained how knives are tools, not toys; that using knives is a privilege, not a right. We then spent a whole day practicing carving soap and apples with butter knives. They all had to earn knife certification, where they proved to an instructor that not only could they regurgitate the information, but they could also explain what it meant to them in their own words, while demonstrating with a butter knife and a stick. Then they were able to use the fixed-blade steel knives. We gave them specific tasks, like carve the tip into a square, or remove all the bark. Soon they were ready to learn different skills, such as how to get rid of knots on the sides of sticks, or how to make a “flower” out of a stick. I was with that same group of students in a later class, and they were carving pumpkins with knives—not the typical carving knife set you buy for $3.99 at Target, but real, stainless steel knives with a fixed blade. One of the children was celebrating his sixth birthday. It. Was. Amazing. The level of focus, care, and observance of safety rules was astounding. We have a few basic rules at Earth Native; we call them the ABCs of carving, and the children follow them to a T. They even help one another, telling fellow students if they are too close to them while they are carving, or reminding others to carve away from themselves. A couple of weeks ago, at the preschool program I teach, we went on a hike. It was probably half a mile—some uphill, some climbing over rocks, some down rocks. Before we came to a hill, I would warn them and suggest some options for safe travel. As they climbed, I commented on how they did, using positive reinforcement. I would say, “I like how (name) is using both their feet AND hands to get down the rocks,” or “Way to sit on your bottom and scoot down this slope!” And they did great. I also said that whenever we see poison ivy, we should turn to the person behind us, point to it, and say “Poison ivy, pass it on!” I’ve also called it “P.I.” in other classes, and the kids just love to point it out because it has a cool nickname. Best of luck, and happy exploring! 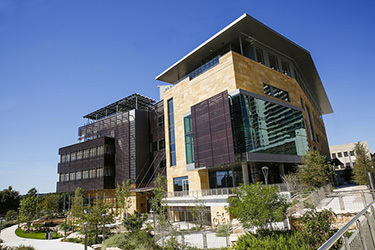 The Inside Outside School is known for its innovative incorporation of the outdoors into its academic curriculum. This guest post from IOS director Deborah Hale is adapted from photo essays she posted earlier this month on the school’s blog. Reading this might just lead you to try a few of these activities with your own kids this summer! We are always looking for ways to get outside for math and science. Some of the most popular ways at our school involve math trails. In fact, a few months ago I decided to write a book about math trails. I thought it would be easy because I am so passionate about the topic, but it’s hard to convey on paper the excitement of an outdoor math adventure. I'm wondering if this should be a movie instead. On this math trail there are a few stations where students find a whiteboard with a problem typical of what we've been doing in class. They have a trail map to record their work and answers on a clipboard. The magnetic garage door of the theater building is an excellent stop on the trail, now that we have a set of large magnetic money. 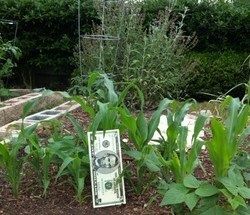 By the way, when you are studying money-related math outdoors, money can grow on trees . . .
. . . and even in the garden. This kind of math adventure is so much fun because it is a lot like an Easter egg hunt! Speaking of Easter egg hunts, at station #3 on the trail, students found three eggs hidden under a traffic cone, each with six shells in it. The traffic cones are a great way to make it clear where the math stations are set up. The driveway is part of our outdoor classroom. We used concrete paint to mark large number lines and a blank hundreds chart. Here you can see examples of some of our manipulatives: wooden number blocks that the shop classes helped to create, felt number patches made last year in sewing classes, and wooden ten sticks. This student has just solved 82 minus 29. These activities all happened on the school grounds not far from the buildings. Next we found out what a math trail can look like in the woods down by the creek. 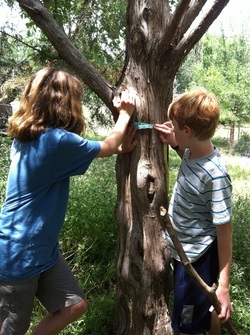 Upper elementary students used the stick method to measure the height of trees. All you need is a stick and a measuring tape. They also worked to find the diameter of trees after determining the circumference. The circumference is measured at 4.5 feet up from the ground. Then you divide the circumference by pi (3.14). It is great to estimate before measuring, and then you can always throw in a little subtraction when you determine the difference between the estimate and the actual measurement. A final activity was measuring the canopy of a tree. 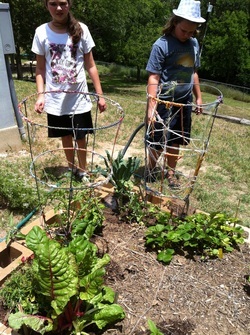 Another great way to integrate math and science is with a square foot garden. 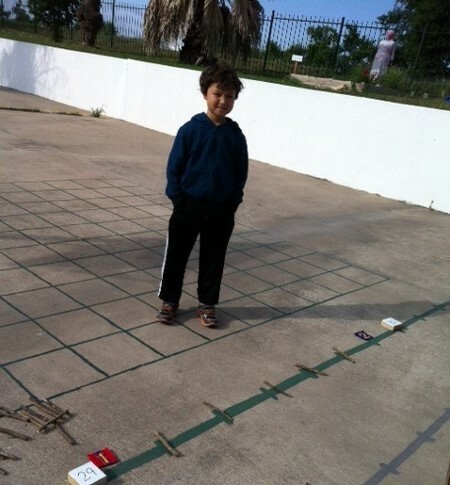 You can see the string that the students used earlier in the year to mark off the squares after measuring the perimeter and area of the planting space. Once the garden is divided, students must research the plants they want to cultivate to find out how many each square will support. We have harvested and replanted this garden throughout the school year. Growth of plants can be measured, recorded, and compared. Another part of gardening is weighing the harvest and recording the data. Then you get to use the basil and tomatoes for making lasagna! Integrating math into cooking is another great way to make connections. This has been indoor work for us so far, until we get the rest of our outdoor kitchen set up (unless we are using our cob oven). 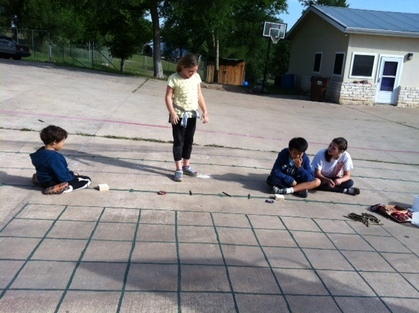 During our Native American cultural study, students created active learning connections in the garden by setting up a “three sisters” garden with Helen, our nature science teacher. We even “planted” a dead fish from our creek to enrich the soil. The corn provides a pole for the beans, the beans stabilize the corn plant and fix nitrogen, and the squash acts as mulch to prevent evaporation of moisture in the soil. The nutritional elements of these foods add additional material for learning. Helen recently noticed some caterpillars and chrysalises on a mustard plant, so she brought in a number of books for the students to use to find out what they were seeing. 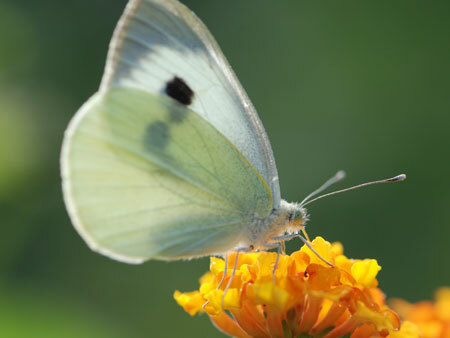 It turned out to be a cabbage butterfly, and the following week we all got to see one of them freshly emerged and drying its wings. We encourage you to step outside whenever you can, too, and see what you can learn!